Note: Once you order this font, we will email this order to your email address. 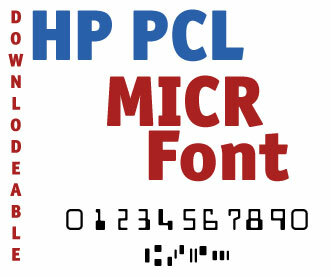 Need a MICR font with more options? We purchased the "stock" MICR fonts online for HP Laser but they didn't have the size attributes we needed nor did they work on the Lexmarks printer. I called and talked with Lance, who turn around another file to correct this issue. It did cost an additional fee to get the size attribute changed but it was reasonable. Awesome group to work with.